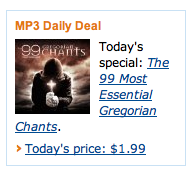 Never has the phrase "most essential" been so generously applied to a collection of 99(!) songs. And even though it was a "daily deal" last week, the price seems to be holding at $1.99. That's about two cents per chant. There's a really bad pun in here somewhere, something like "don't miss this chants, they're two e-cent-ial to pass up" but I'm not gonna go for that kind of cheap humor. Not today. UPDATE: Due to what I assume must be overwhelming demand driven by this post, the price is now back to $5.99. Sorry if you missed it!